October 19, 2008: Happily edited to Add that these two old gals are in a new home in Virginia. Thank you, Kathryn! Two former school horses in Baltimore that are to be sent to auction Oct. 1 if a home cannot be found for them. Their information is below. Please contact Russell Ashton at rashton@fbw.com W)1-800-795-9322 or H)410-433-7760 if you can help. >>As you may know, the Park School horseback riding program has ended. We have been very busy trying to find new homes for our beloved animals by September 30. The two ponies are very happy in their new wonderful homes, however our two horses, Annie and Dory, are still waiting to be adopted. Annie and Dory have lived at Park for many years. They have served our students well. Young riders have learned not just how to ride, but how to care for horses. They are great, well-behaved horses who deserve a peaceful retirement. They are kept on pasture with a run-in shed and are easy keepers. Annie is a chestnut quarter horse mare in her mid-twenties. She is gentle and walks, trots, and canters. Since she lunges well, she has been a mainstay in our former program. She has provided many children with wonderful lessons. She still enjoys trail rides and can handle gentle riding. She has been diagnosed with Cushing’s Disease, which is common to many older horses, and has responded well to medication given in her food. Annie would be a great horse for beginners or for the casual experienced rider. She is what we call rock steady. Dory is a 32-year-old bay thoroughbred. Despite her age, she is in very good condition and has no complicated health needs. She can still be casually ridden and willingly walks, trots, and canters. We would like to place her in a home where she could simply grace the pasture with some other horses. Both horse have been vetted and have a negative Coggin’s report. 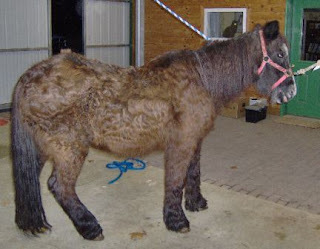 If you can help Virginia's horses in need, please join http://forums.delphiforums.com/VAhorsesneed/start and lend a hand. Offer haven for horses in need, volunteer with a Virginia rescue organization, or spread the word to friends looking for new equine family members. As many know, rescues in VA have been increasingly overwhelmed by calls from pepole needing to find new homes for horses.....most due to financial/economic reasons. Meanwhile, we know there are coupons for different types of horse feed floating around out there. We're sending out what coupons we have while owners wait for homes to come along, hoping they won't need to cut back on feed while they wait. If you have any extras.........any type, any brand........please consider sending them to TREES, PO Box 2260, Spotsylvania, VA 22553, or to someone else who can either use them themselves or pass them along to someone in real need. "We will forever remember our loved ones, friends and colleaques"
As the hours of daylight decrease and colder weather approaches, our horses are beginning to replace their sleek summer coats with thick winter woolies. 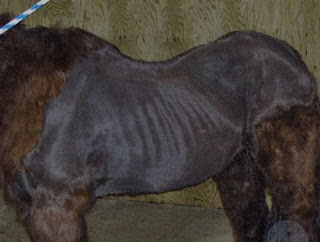 Many elder horses tend to grow thicker winter coats than they did in younger days. This is especially true of horses with Cushings Disease or PPID. Thick coats can hide changes in physical condition. It is not uncommon for elders with marginal dental challenges to lose weight over the winter when tender pasture grass is replaced by chewy hay. Subtle changes in weight may not be immediately obvious under winter wear. Begin now to note how your horse's body feels when you groom, scratch or hug him. Take note of the flesh, not only over the ribs, but also along the topline, over the hip bones and rump and across the shoulders. As the winter coat develops, feel under the hair for any changes in weight. Running your hand over the surface of a thick coat may not give an accurate assessment of condition. Oracle ("Ori") shows how a Cushings coat can hide weight loss. Visually, there is no indication that Ori is underweight. So, goose your geezer, feel your fogey, scratch your senior. Get under that winter coat and monitor weight by feel rather than by sight. If needed, increase feed a little, use a blanket on cold nights to conserve calories, or find a more appropriate winter substitute for pasture. Its easier to prevent weight loss in winter than to put weight back on in winter. Goose early, goose often. Don't risk an unpleasant surprise when spring shedding begins. 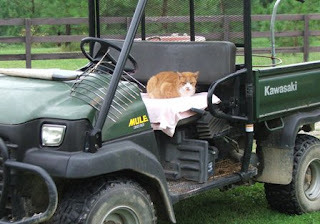 This is Rufus, Traveller's Rest's new Supervisor of Horse Manure Management. Stafford, VA. A 25 year old Thoroughbred mare is in search of a new home. Her owner, one of a growing number of horse owners in this position, is faced with this terrible decision to due a combination of finances and the ever increasing acres of farmland disappearing under housing "developments." This former foxhunter is sound for flat work, but her owner does not feel she should do any more jumping, having some arthritis, as we all do at her age. She does better with a confident rider than with a nervous beginner, but will do okay as a lesson horse on lead- or longe-line. UTD on vaccinations. Barefoot now, but may need shoes if in regular work. Looking for new home by the end of September. Serious inquiries, contact Traveller's Rest Equine Elders Sanctuary for owner's info.